Saturday night the two newest teams in the National Lacrosse League met for the first time in a highly anticipated match. The Philadelphia Wings (2-10) and the San Diego Seals (7-4) faced off in a classic battle that fell the way of the Seals 13-11. The Wings were looking for a win over a team that, in theory, was on level ground with them. In reality, of course, the Seals have had a spectacular inaugural season and Saturday was no different with an inspiring comeback win that had the crowd of 7606 on their feet at Pechanga Arena. As the game started the Seals scored twice within 26 seconds for a quick two goal lead at 3:48. Kevin Crowley responded in that same amount of time to cut the lead in half before Dangerous Dan Dawson would find the back of the net for his first of five on the night. Josh Currier would find twine just a little over a minute later and Kiel Matisz scored with under a minute to go in the quarter to tie the game at three. Dawson has 858 career assists. The second quarter was all San Diego as they outscored Philadelphia 4-1. Dawson collected the first two of the quarter to record the hat trick early. Josh Currier would net his second before Kyle Buchanan gave the Seals a 7-4 lead at 12:07 of the second quarter, which is how the half ended. As has been the case in other games, the Wings’ offense woke up in the third. They outscored the Seals 4-0 in the quarter and made it a six-goal run 2:22 into the fourth. Suddenly, the Wings’ led 10-7 with all the momentum. Crowley scored twice in that run to record a hat trick. The Wings cooled off after that and for the next eight minutes both teams applied pressure, but defense and goaltending came up big, especially for the Seals. Unfortunately for the Wings, their defense fell apart in the last five minutes, allowing six goals. At 10:05 of the final quarter, after 27:58 without a goal for the Seals, they opened the flood gates and pumped four past Doug Buchan. 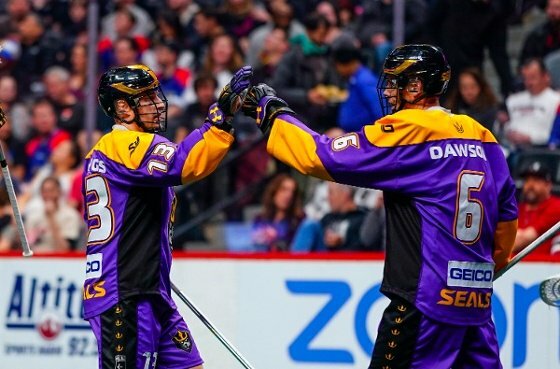 Casey Jackson and Dawson scored 42 seconds apart and then paired up again with goals 30 seconds apart to give them a one-goal lead at 11-10 with 2:03 to go. Josh Currier let a bomb go from the restraining line to complete his hat trick to tie the game back at 11 just 25 seconds later. But Austin Staats caught a high pass with 1:12 left to go and dodged a defender to score the game winner. Tuner Evans added an insurance marker for the 13-11 victory. Dawson led the Seals with five goals and two assists. Garrett Billings had seven assists. Staats chipped in with a pair of goals and three assists. Frankie Scigliano stopped 34 of 45 shots for the victory. The Wings’ offense was led by Currier (3G/4A), Kevin Crowley (3G/3A) and Kiel Matisz (2G/4A). Doug Buchan stopped 41of 54 shots and was saddled with the loss. This marks the eighth time the Wings had a game decided by two goals or less. In those games the Wings are 1-7, and in many they had the lead and let it slip away. Special teams are an area of concern; Philadelphia is fourth in penalty kill at 55.6%, but the power play is where a lot of their losses come from. The Wings are back in action this Saturday at 7 p.m. for Fan Appreciation Night as the New England Black Wolves come back into town. San Diego’s next contest is Friday night when they host Saskatchewan.